A least concern (LC) species is a species which has been categorized by the International Union for Conservation of Nature (IUCN) as evaluated as not being a focus of species conservation. 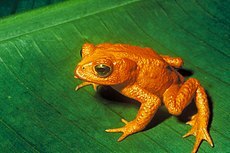 They do not qualify as threatened, near threatened, or (before 2001) conservation dependent. Species cannot be assigned the Least Concern category unless they have had their population status evaluated. That is, adequate information is needed to make a direct, or indirect, assessment of its risk of extinction based on its distribution or population status. Since 2001 the category has had the abbreviation "LC", following the IUCN 2001 Categories & Criteria (version 3.1). However, around 20% of least concern taxa (3261 of 15636) in the IUCN database use the code "LR/lc", which indicates they have not been re-evaluated since 2000. Before 2001 "least concern" was a subcategory of the "Lower Risk" category and assigned the code "LR/lc" or lc. While "least concern" is not considered a red listed category by the IUCN, the 2006 IUCN Red List still assigns the category to 15636 taxa. The number of animal species listed in this category totals 14033 (which includes several undescribed species such as a frog from the genus Philautus). There are also 101 animal subspecies listed and 1500 plant taxa (1410 species, 55 subspecies, and 35 varieties). There are also two animal subpopulations listed: the Australasian and Southern African subpopulations of spiny dogfish. No fungi or protista have the classification, though only four species in those kingdoms have been evaluated by the IUCN. Humans qualify for this category, and in 2008 were formally assessed as such by the IUCN. ^ "2001 Categories & Criteria (version 3.1)" (PDF). The IUCN Red List of Threatened Species. Archived from the original (PDF) on 2016-01-28. Retrieved 2015-05-22. ^ "Philautus sp. nov. 'Kalpatta'". The IUCN Red List of Threatened Species. Retrieved 2006-12-19. ^ Global Mammal Assessment Team 2008. (2008). "Homo sapiens (human)". The IUCN Red List of Threatened Species. doi:10.2305/IUCN.UK.2008.RLTS.T136584A4313662.en. This page was last edited on 4 April 2019, at 02:02 (UTC).